Every Permian Basin landman has spent their fair share of time in the busy courthouses and records rooms of West Texas, scouring through deeds and leases. It seems the longer that you are in the land business the more you come to appreciate and track which counties and courthouses you have worked in. Over time you begin to appreciate the beauty and history behind each courthouse. At Peak Land Services we asked our team to do some thinking and research on which court houses they liked the most. We’ve rounded up a few of our favorites below. 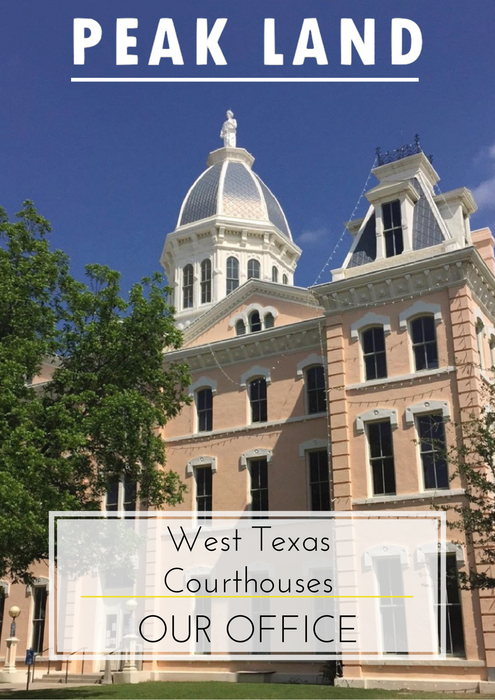 Despite how busy the Martin County Courthouse can be it has one of the best histories of any courthouse in West Texas. Martin County was established in 1824 by a group of colonists who were a part of the Stephen F. Austin old 300 that received a land grant from the Spanish to settle the area. Later on, a group of Carmelite priests established a monastery in the county and the first Catholic mass was held on the ground of the present-day courthouse. The original courthouse was built in the 1880s and unfortunately no longer stands today. However, the current courthouse stands as a testament to a very interesting part of Martin County’s history. If you haven’t spent much time doing title out in Loving County, then you haven’t experienced Mentone, Texas, where oil wells outnumber the residents almost ten to one. Loving County is one of the least populated areas in the nation with over 670 square miles and only 100 or so residents. Loving County seems almost to be a rite of passage for any West Texas Landman. Before permanent settlement of the area began, in 1583 Antonio de Espejo, a Spanish explorer, crossed the Pecos River while on an expedition to New Mexico. The county was named for Oliver Loving, an early cattleman who was killed by native Americans in the mid-1800s. It is also the only county in Texas to have been organized twice. The original courthouse was built in 1935 and still stands today. Until the recent Apache Corporation, “Alpine High” play there has been very little activity in the county over the past decade, and most landmen haven’t had the pleasure of making the drive out to the courthouse for work related reasons. But the drive alone makes this courthouse a favorite among the Peak Landmen. When making the trip from Midland, after passing Balmorhea, you find yourself in a landscape that one would not picture as being in Texas. 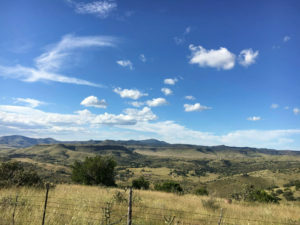 Located in the Davis Mountains, the county sits at one of the highest elevations in Texas. In 1854, Lt. Col. Washington Seawell and troops of the Eighth United States Infantry arrived to establish Fort Davis, named for the Secretary of War Jefferson Davis, which would later become the county seat. Before 1910, the county didn’t have a designated courthouse so the Commissioner’s Court met with a Dallas-based architect to build a courthouse. The courthouse was constructed in the Classical-Revival style and still stands today. The Peak Land Services Team is passionate about the work that we do, and we often work long hours in small town courthouses for months on end. 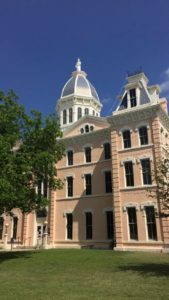 Over time you end up getting to know the staff and the town a little bit better and every landman has a favorite courthouse for various reasons. Anyone who shares our passion for landwork will understand our love of these historic buildings and the stories behind the towns built around them. If you’re looking for a Land Services Company that you can trust and that truly has a passion for landwork, then give Peak Land Services a call; we’d love to tell you about all that we do!